The location: Graham Paint & Hardware. A. A paint & hardware store. A. Only once, in a brief scene in Episode 7 (of Season 4), "Slack Tide". 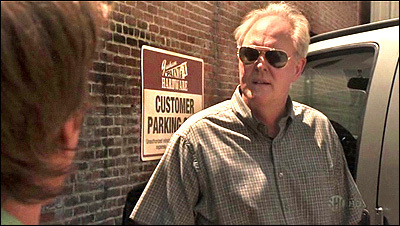 In the scene, Dexter is still convinced that Arthur Mitchell (the Trinity Killer) is doing a great job as a father and family man. And since Dexter is struggling on that front, he seeks out Arthur, to see if he can get any tips about how he manages to juggle both a family and his dark hobby. 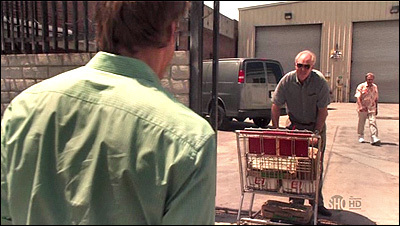 So Dexter shows up (posing as 'Kyle') while Arthur is finishing up shopping at a hardware store, and helps him load his building supplies into the back of his van. While he's at it, he pumps Arthur about his parenting methods. He learns that Arthur keeps his kids busy by getting them involved in various clubs and hobbies. Dexter realizes that this would free up time for him to pursue his other interests. But he also thinks there's more to be learned from Arthur, so before leaving, he claims to be alone, and manipulates Arthur into inviting him along on his next outing. (That turns out to be an unexpected trip to a forest to cut down a tree - and accidentally hit a deer. A. The driveway of an industrial building. A. They created this "store" in what appears to be a driveway of sorts, an outdoor space located on the north side of Associated Shower Doors, located at 427 S. Hewitt Street, in the warehouse/artists district of downtown Los Angeles. That space is between 427 S. Hewitt Street and the next door building at 405 S. Hewitt (Sunrise charter buses). Both buildings are on the west side of Hewitt Street, just south of E. 4th Street. Iron gates block this driveway, and Arthur's van is parked just inside those gates, against a brick wall that is actually the north wall of Associated Shower Doors. The producers put up a couple of signs reading "Graham's Paint & Hardware", and conveniently parked a large truck just north of the location on Hewitt, to block the view of photographer Jonathan Farrow's studio. , which is just a few doors down. This location is also near both Tito's Bar & the old boxing gym. A. I came across a short list of downtown filming notifications (designed to warn downtown residents about filming that might affect their lives), and there were three Dexter filmings listed: one on Santa Fe (Tito's Bar), and two nearby on 6th Street (this location and the photographer's studio). 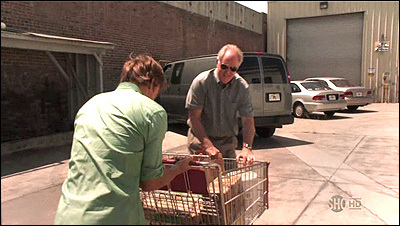 Since this scene appeared in the same episode as the photographer's studio, it was reasonable to assume they might have used the other building for this scene. So I checked. Using Google StreetView (see above) to look at both locations, I was able to match up this space with what is shown in the episode.